Place 17x12-inch sheet of waxed paper on cookie sheet. Cut gingerbread cookie dough in half lengthwise. Arrange halves, side by side, on cookie sheet. Top with second sheet of waxed paper. Roll dough to form 15x9-inch rectangle. Freeze 5 minutes. Repeat on work surface with sheets of waxed paper and sugar cookie dough. Freeze 5 minutes. Remove top sheet of waxed paper. Lifting dough with waxed paper, turn sugar cookie rectangle upside down onto gingerbread rectangle. Gently pat doughs together. Refrigerate 15 minutes. Remove waxed paper from top of dough. Using remaining waxed paper and starting with 1 long side, roll up stacked dough jelly-roll fashion, without rolling paper into roll. Wrap roll of dough securely with waxed paper. Freeze about 45 minutes or until very firm. Heat oven to 350°F. Unwrap dough; cut into 4 equal rolls. Work with 1 roll at a time; keep remaining 3 rolls in freezer until ready to slice. Cut each roll into 13 or 14 (1/4-inch) slices. On ungreased cookie sheets, place slices 2 inches apart, reshaping into rounds as necessary. Sprinkle each cookie with sugar. Bake 10 to 12 minutes or until edges are golden brown. Cool 2 minutes; remove from cookie sheets to cooling racks. 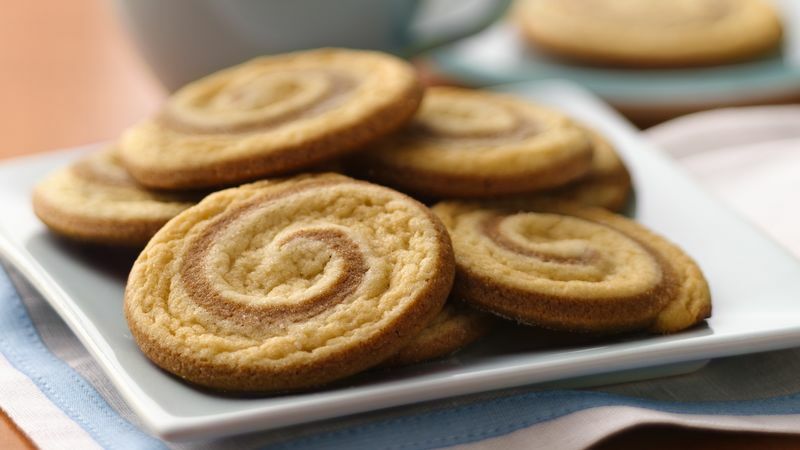 Substitute refrigerated peanut butter cookie dough for the gingerbread dough to make two-toned peanut butter pinwheels.